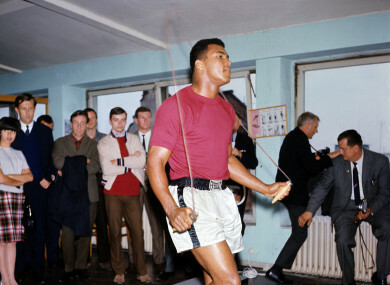 Muhammad Ali trains for a bout in 1966. THE FOLLOWING PASSAGE is an extract from Ali: A Life by Jonathan Eig. A long, black Cadillac glides past waving palm trees and stops in front of the Surfside Community Centre. The afternoon sun flashes off the car’s chrome bumpers. Cassius Clay gets out. He’s dressed in a custom-made denim jacket and swinging a dandyish walking stick. He checks to see if anyone has noticed him. Clay is tall and stunningly handsome, with an irresistible smile. He’s a force of gravity, quickly pulling people into his orbit. Horns honk. Cars on Collins Avenue stop. Women lean out of hotel windows and shout his name. Men in shorts and girls in tight pants gather around to see the boastful boxer they’ve been hearing so much about. As the crowd grows, the chief of police arrives and tries to move Clay off the street and into a parking lot where he might cause less trouble. A newspaper photographer points his camera, but instead of smiling Clay opens his mouth wide in a pantomime scream. He throws a left jab that stops inches short of the camera. Liston is the most punishing boxer in more than a generation, with fists each measuring 15 inches around and a chest jutting forth like the front end of an M4 Sherman tank. He is fearless and vicious. How vicious? Once, he started a fight with a cop, beat the cop senseless, snatched his gun, picked him up and dumped him in an alley, and then walked away smiling, wearing the cop’s hat. Liston does not merely defeat his opponents; he breaks them, shames them, haunts them, leaves them flinching from his punches in their dreams. Sonny Liston is America’s curse. He is the black menace sprung from white racist stereotypes. And he likes it that way. Liston steps into the sun to meet the troublemaker. He swats away the outstretched hands of fans and marches until he’s nearly within punching distance of Cassius Clay. In a cramped hotel room near John F Kennedy Airport in New York, 38-year-old Malcolm X talks into the night, telling his life story to a reporter. Malcolm is a tall, lean man with a strong jaw and horn-rimmed glasses. Even smiling, he bears a stern expression. Malcolm paces as he dictates, sitting only to scribble notes on napkins. He can’t wait until old age to produce his autobiography. He’s recently been suspended from the Nation of Islam for disobeying the radical group’s leader, Elijah Muhammad, and doesn’t know if he’ll ever go back. A few months earlier, Elijah Muhammad had ordered his ministers not to comment on the assassination of President Kennedy, out of respect for a nation in mourning, but Malcolm had spoken out anyway, saying the killing was an outgrowth of the violence sown by America in Vietnam, the Congo, and Cuba. There are other issues, other forces driving a wedge between Malcolm and his teacher. Malcolm has learned that Elijah Muhammad had fathered numerous children with young women employed by the Nation of Islam. Malcolm has been telling others in the organisation about their leader’s disappointing behaviour. Now, Elijah Muhammad is furious, and rumors have made their way to New York that Muhammad wants Malcolm X dead. All his life Malcolm has survived. He’s survived poverty, prison, and knife fights. He plans to survive this, too. This is where his struggle for survival starts: in a hotel room by the airport, working on his autobiography, because words give power. And Malcolm isn’t going to let Elijah Muhammad or J Edgar Hoover’s Federal Bureau of Investigation or the white news media or anyone else define him with their words. He will define himself with his own words, his own new credo, on his own terms. A great revolution is building in America. The prevailing racial order is under attack with a fury not seen since the Civil War. Black men and women are awakening and fighting for power. Change is coming, finally, and Malcolm is determined to push it — force it, if need be — regardless of what Elijah Muhammad or anyone else has to say. It’s two in the morning when Malcolm leaves the hotel and drives to his home in Queens. An FBI agent monitors his every move. When the plane touches down in Miami, a car waits to carry Malcolm and his family to their blacks-only motel on Miami Beach. According to an FBI informant, the driver is Cassius Clay. It’s the morning of the fight, time for the combatants to meet the press, show off their powerful bodies, and step on the scales to check their weights. The room reeks of cigarette smoke, body odour, and cheap cologne. The reporters have never seen a professional athlete behave so unprofessionally. Some say Clay has lost his mind, that fear of Sonny Liston has made him snap. Everyone in the room is talking, but Clay is talking loudest of all. “No chance! No chance!” he hollers, ignoring the boxing officials threatening to fine him if he doesn’t shut up. Like Malcolm X, Clay won’t be told what to do. He’ll beat the odds and defy the expectations of any who would seek to control or exploit him. Clay points at Liston, saying he’s ready to fight the champ now, this very instant, without gloves, without a referee, without a paying audience, man against man. His face shows no trace of humor. He yanks off his white robe, revealing a long, lean, brown physique, his stomach and chest muscles rippled. He lunges at Liston as members of his entourage grab hold and restrain him. Maybe Clay’s not crazy. Maybe he knows instinctively, or from the experience of growing up with a bullying, violent father, that the worst thing a threatened man can do is show fear. Liston warns opponents about the power of his punch, both its short- and long-term effects. Cassius Clay might run away for a round or two, but Liston promises he will catch his young opponent sooner or later, and, when he does, he will hit Clay so hard his brain will flop out of its cups. Gray smoke hangs under brilliant white ring lights, obfuscating everything in sight. Reporters peck their portable typewriters and brush cigarette ash from their neckties. There’s little debate among the men in the press corps about who will win tonight. The question — the only question, in most minds — is whether Cassius Clay leaves the ring unconscious or dead. This is more than a boxing match, and at least a small percentage of the people in the Miami Beach Convention Centre understand that. They sense there are brutal, romantic forces building beneath the placid surface of American life, and that Cassius Clay is a messenger for the change to come, a radical in the guise of a traditional American athlete. Malcolm gazes up into the ring lights from the front row, where he sits with the singer Sam Cooke and the boxer Sugar Ray Robinson. Rumors swirl that Malcolm plans to bring Cassius Clay into the Black Muslim fold. Retired heavyweight champ Joe Louis sits ringside too, leaning into a microphone and describing the action for fans preparing to watch the fight in black and white on movie-theater screens across the country. Louis, known as the “Brown Bomber” during his boxing days, was the greatest heavyweight of his generation, a black man who earned the admiration of white Americans for his service in World War II, for defeating German boxer Max Schmeling in 1938, and for showing humility: accepting that even a black champion should never behave as if he were the equal of an ordinary white man. Clay enters the ring and removes his robe to reveal white satin shorts with red stripes. He dances on long, lean legs and flicks jabs at the air to stay loose. Liston makes Clay wait and then lumbers slowly and silently through the arena and into the ring. “That’s the only time I was ever scared in the ring,” Clay will say years later, after he has won and lost the heavyweight championship three times; after he has declared his loyalty to the Nation of Islam and taken the name Muhammad Ali; after he has become one of the most despised men in America and then, presto-change-o, one of the most beloved; after he has become everything from a draft dodger to an American hero; after he has established himself as one of the greatest heavyweight boxers of all time: a fighter with an unmatched combination of speed, power, and stamina, with a freakish ability to absorb punishment and remain standing; after he has become the most famous human being on the planet, “the very spirit of the 20th Century,” as one writer called him; after Parkinson’s disease and somewhere around 200,000 blows to the body and head have robbed him of the very things that made him astonishing: the swiftness, the strength, the charm, the arrogance, the wordplay, the grace, the force-of-nature masculinity, and the boyish twinkle in his eyes that said he wanted to be loved no matter how outrageously he behaved. Cassius Clay’s celebrity will carry through the civil rights era, the Cold War, the Vietnam War, the terrorist attacks of September 11, 2001, and well into the 21st century. He will live to see his boyhood home in Louisville turned into a museum, and, across town, yet another, bigger museum built to honor his legacy. The arc of his life will inspire millions, even if it ignites adoration in some and revulsion in others. Much of Clay’s life will be spent in the throes of a social revolution, one he will help to propel, as black Americans force white Americans to rewrite the terms of citizenship. Clay will win fame as words and images travel more quickly around the globe, allowing individuals to be seen and heard as never before. People will sing songs and compose poems and make movies and plays about him, telling the story of his life in a strange blend of truth and fiction rather than as a real mirror of the complicated and yearning soul who seemed to hide in plain sight. His appetite for affection will prove insatiable, opening him to relations with countless girls and women, including four wives. He will earn the kind of money once reserved for oil barons and real-estate tycoons, and his extraordinary wealth and trusting nature will make him an easy mark for hustlers. He will make his living by cruelly taunting opponents before beating them bloody, yet he will become a lasting worldwide symbol of tolerance, benevolence, and pacifism. His extraordinary gift for boxing will cement his greatness and make the many contradictions of his life possible. Yet this will be the bitterest irony in a lifetime full of them: his great gift will also instigate his downfall. In the fight’s opening seconds, Liston throws big lefts and rights, going for one of the quick knockouts he has come to expect, to depend on. Clay dodges and ducks and bends backward like he has a rubber spine. Liston clomps forward, forcing Clay into the ropes, where big hitters usually destroy fancy-footed opponents. But just as Liston’s eyes go wide in anticipation of murder, Clay slips sideways, and a left hook by Liston whistles past, hitting only air. Clay dances in a circle, fast and light as a hummingbird, and then, suddenly, flicks a left jab at Liston’s face. It lands. Thousands of voices scream as one. Liston unleashes another powerful right, but Clay ducks and slides left, entirely avoiding the blow. He straightens and flicks another jab that meets its mark, and then another. There’s less than a minute left in the round when Clay throws a hard right that thuds solidly against Liston’s head. Clay dances, then plants his feet ever so briefly and unleashes a machine-gun-fast flurry of punches, right-left-right-left-left-right. Every shot connects. The crowd is roaring. Liston is ducking for cover. Clay is finally showing what he’s known all along: that what he can do is more important than what he says. And what Clay can do is fight. Ali: A Life by Jonathan Eig is published by Simon & Schuster. More info here. Email “'Bad guys are supposed to lose. I change that. I win'”. Feedback on “'Bad guys are supposed to lose. I change that. I win'”.